There are Many Senior Retirement Communities in the Orlando, FL Area. Why Choose Hyde Park? If you are looking at senior retirement communities in the Orlando area in anticipation of living either full- or part-time in Florida during your retirement, then be sure to pay a visit to the 55+ community of Hyde Park. Our community, which has a superb location just minutes away by car from downtown Orlando, is a wonderful place to call home during your retirement. It is a welcoming and professionally managed retirement development that caters to the lifestyle goals of active adults 55 years of age and older. Of course, there are always plenty of fun things going on within our community to keep our residents active. 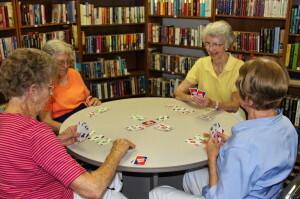 Hyde Park residents frequently gather together at our clubhouse to play Bingo, celebrate special occasions, serve up delicious potluck dinners, make new acquaintances, and share laughs with longtime friends. Contact Hyde Park today to learn more. If you are going to be in the Orlando area and would like to see for yourself what makes us one of the top senior retirement communities in FL, we will be pleased to take you on a guided tour.